a representative stand B5 in Hall 2. Our focus this year will be on the products of our German business partner Zehnder Pumpen. The product range of Zehnder Pumpen extends on submersible pressure pumps, submersible grinder pumps, submersible sewage pumps, submersible waste water pumps, pumping stations, sewage lifting units, sewage lifting units with cutting system and sewage lifting stations, condensate pumps, below-ground waste water lifting units, rainwater harvesting systems, above-ground waste water lifting units, borehole pumps, universal sludge suckers and etc. During the exhibition we will introduce and the products of the leading companies Grindex, Shakti, Grundfos. 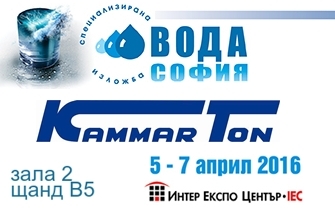 We expect you to the 10th edition WATER SOFIA from 5 to 7 April 2016! Free entrance with the INVITATION!